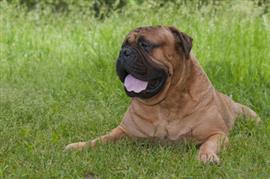 The Mastiff is one of the largest breeds of dog and comes with an equally large list of names. As with any breed, many common names can be traced back to its roots. The Mastiff comes from England where favorite names include Axel, Dorian, Cedric, and Boris. No list of Mastiff names is complete without options that favor the distinct appearance of the breed. The breed's coat color comes in various shades of tan that has inspired many owners to select names like Tanner, Sandy, and Teddy. A distinctive black mask has led to a few interesting Japanese inspired choices including Ninja, Samurai, Hattori, and Hanzo. Perhaps the characteristic that sets the breed apart is its massive size. Some equally hefty and commonly use names include Tank, Hulk, and Goliath. Other fun name options can be borrowed from professional defensive lineman which are also known for their size and strength. Among the most famous include Reggie, Deacon, and Page. Some of our pages will contain a subcategory. A subcategory is a slightly more specific grouping than the main topic of the page. For a subcategory, we will include a separated table of names and corresponding descriptions. An example of a subcategory of Red Dog Names would be 'Dog Names Inspired by Red Wines'. If you have any subcategory ideas for the Mastiff Names page, we would love to hear them. Use the form below to submit your ideas.